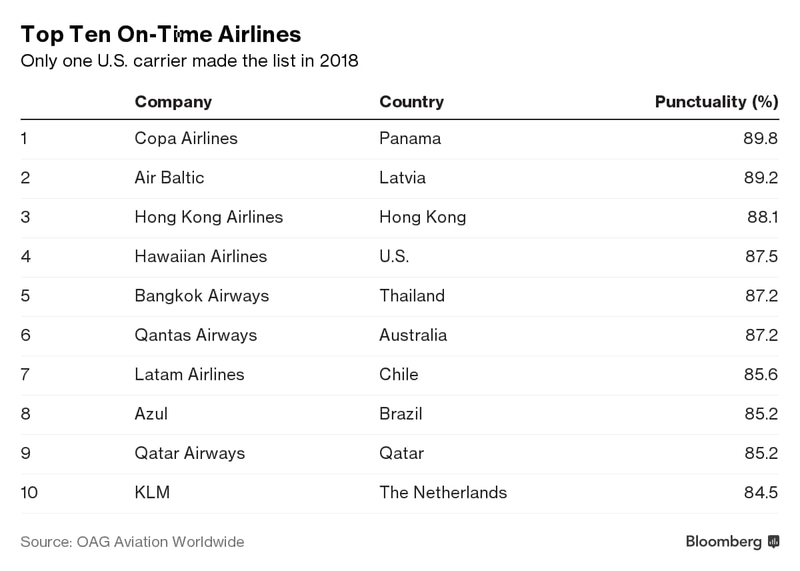 Singapore: Panama’s Copa Airlines SA has been crowned 2018’s most punctual carrier in a global survey -- but no major US airline made it into the top five. Latvia’s Air Baltic ranked second among airlines arriving or departing within 15 minutes of scheduled times, according to a report by data firm OAG Aviation Worldwide Ltd. Hong Kong Airlines, Hawaiian Airlines and Bangkok Airways rounded out the top five. But among major U.S. carriers, Delta Air Lines Inc. was the only one to make it into the top 20. However, among the world’s major carriers, Latam Airlines was the most punctual, the report showed, with Delta, Alaska Airlines, Southwest Airlines, United Airlines and American Airlines featuring in the top 10 rankings. Economic growth and a swelling middle class will help double the number of global air passengers to 8.2 billion in 2037, the International Air Transport Association projected. More than half of those fliers will come from the Asia-Pacific region, propelled by demand from countries such as China and India. About 4.3 billion passengers traveled by air last year, 6.1 percent more than in 2017, according to a preliminary report by the United Nations’ International Civil Aviation Organization. Airlines filled a record 81.9 percent of their seats in 2018, it said. 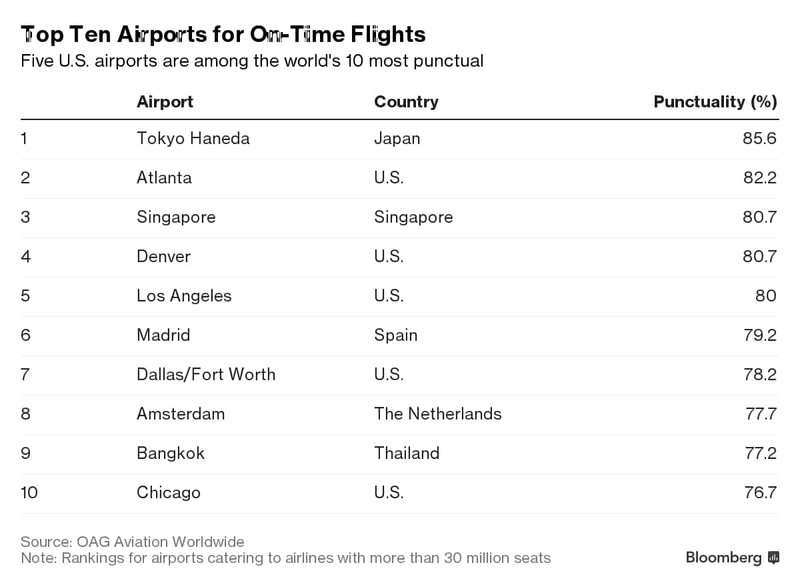 Among mega airports ranked by OAG -- those catering to more than 30 million airline seats -- Tokyo’s Haneda topped the list for the best on-time performance last year. The ranking is based on the proportion of flights at each airport that arrive and leave within 15 minutes of scheduled times. Despite the poor rankings of its airlines, five U.S. airports were among the top 10, with Atlanta ranking second. Los Angeles jumped to fifth place in the 2018 survey from 11th. Bangkok entered the top 10, while London’s Heathrow and Frankfurt dropped out.